The MP5 PIP is another design variant that attempted to improve on the MP5. It never entered production either. A straight blowback weapon like the other prototypes, the PIP or Product Improvement Project appears to be the forefather to the G36 cocking handle, and the Weaver scope mounting system of the UMP. Another fascinating similarity of later design comes in the form of the MP5 PIP. Observe the flat cocking handle on top, which appears to have been adopted on the G36 series rifles and carbines. 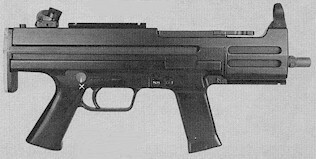 This gun has the sighting system of the MP5, as well as the three lug barrel. These are the only known photographs of the PIP that I have seen, and this is not a working firearm. It is made of wood.